This last August as I was putting books on the shelf for the fall semester at WTAMU I came across the textbook, “History of Women In America” by Janet Coryell, required in Professor Jean Stuntz’s history class. Since it was a used text I thumbed through it and came across the radio speech First Lady Eleanor Roosevelt gave on the eve of the bombing of Pearl Harbor. I can only imagine how the speech writers must have scrambled franticly for just the right words that day to set the tone for the wife of the president. How Mrs. Roosevelt herself must have agonized as she trembled within to address all those who would listen to her voice, the emotion she knew she must convey. I wonder as well what copy the sponsor, The Pan American Coffee Bureau, had to toss out in support of the history unfolding that could very well affect relations with South America. This history book is no longer on the shelf. It had been bought by a college student four months ago. So instead on the anniversary of the “day that would live in infamy” I Googled and read those words again, and listened to a recording of what Mrs. Roosevelt spoke December 7, 1941. She noted her husband was hard at work conferring with his cabinet, the heads of state, and even to the Ambassador to Japan. In so many words she was telling the nation that he had everything well in hand and to leave the worrying to him, a sentiment at the time. But she didn’t discount the fears of the mothers, the young people, the community. She, or her speech writers, knew she only had a few minutes with which to celebrate the strength of our United States built on one hundred and sixty five years of sacrifice on American soil. The world couldn’t know that seventy years later you just had to touch a screen or keypad to take you anywhere in the universe you wanted to travel. Within seconds I pulled up a transcript of that moment in time. I listened to the cultured voice of the president’s wife, the strong words of an American soldier, and the light copy of the advertising sponsor. But the message will always remain the same. Year after year anyone can research any moment of any time recorded in history. I treasure the ability to read, to research, to remember, to write, to memorialize. I celebrate that generations yet to be born will for a thousand, no a million years be able to question and argue history as it unfolds, all the while looking back on the past as it impacts our future. I wonder what key points speech writers will write for the president on that day to commemorate our military and those on the home front at the anniversary of Pearl Harbor. All the while as the American people hold their hands over their hearts as the Star Spangled Banner is played. The following is an excerpt of Eleanor Roosevelt’s speech. “…You have friends and families in what has suddenly become a danger zone. You cannot escape anxiety. You cannot escape a clutch of fear at your heart and yet I hope that the certainty of what we have to meet will make you rise above these fears. We must go about our daily business more determined than ever to do the ordinary things as well as we can and when we find a way to do anything more in our communities to help others, to build morale, to give a feeling of security, we must do it. Whatever is asked of us I am sure we can accomplish it. I don’t know about you, but the last few weeks I’ve been begging people to give me ideas for holiday gifts. More often than not, the response is, “I don’t know.” If it one of the nieces or nephews it’s money or an I Pad. I love to shop for friends and family, but I need hints. I don’t know all the new toys and games, and I definitely cannot shop for clothes for teenage girls. Thank heavens for the kids’ moms and grandmothers. Without them I’d be lost. Sometimes I feel lost in my writing. I think I’m on the right track but I’m just not confident with my story. But I have been given more than one special gift. I’ll start with five fellow writers who have been such an influence on my life. We meet twice a month to share our work and give and receive critiques. 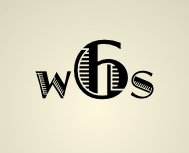 The members of Wordsmith Six never let me down and I hope I never disappoint them. I have Beta readers who take the finished work and give it another set of eyes before submission. And I have great friends and family who encourage and support me. They are the gifts that money cannot buy. I am so thankful I have then. I hope each of my fellow writers is blessed with the gifts of honest and respectful critique partners. I wish you the gift of encouragement from those you love and respect. They are irreplaceable. May the holiday season bring you happiness and a new dedication to the written word. I wish you success in 2014. “First, find out what your hero wants, then just follow him! Setting: A concrete room, similar to an interrogation room in a cops-type TV show. The walls are gray, the light is gray, the floor is gray, and the ceiling is out of the picture. There is a large mirror on one wall right next to the door. Interviewer walks in carrying a laptop computer. She sits in one of the chairs and opens her computer. The door opens and Main Character walks in shyly, head down, eyes peeking out from under her hair. Interviewer: Come in and have a seat. Main Character walks a little further into the room. Main Character (sits in chair timidly) I’m Claire. Interviewer: Hello, Claire. What have you come to tell me? Claire: Well, I’m going to tell you how I came to be where I am. Interviewer: I’m not sure I understand. Claire: Well, I’ve had a little . . . adventure. I stood in line out there (motions with head toward the door) waiting my turn, and now it’s here. So I get to tell you my story. Interviewer: I know exactly what you mean. I’m the same way about coffee. Claire: (Smiles softly) Then you’ll understand my story. Interviewer: (Returns smile) Of course I will. Claire: It happened like this . . . I simply take dictation while my characters talk. After all, they’re the ones telling the story. Your assignment: What came next? Post in the comments below. And, by all means, have fun. Recently a student brought textbooks into our bookstore to sell. None of them were being used for the next semester, and a couple were so damaged we were unable to buy them back. Rather than tossing them into the dumpster they decided to leave them with us after we explained that the Mortarboard at WTAMU had a fundraising project to recycle used books. After the students left I thumbed through some of them. One was “The Western Heritage” and covered not cowboys or cattle drives, but Greeks, Romans, Thucydides, Aristrophanes, and the like, the very basis of our civilization. All Greek to me. 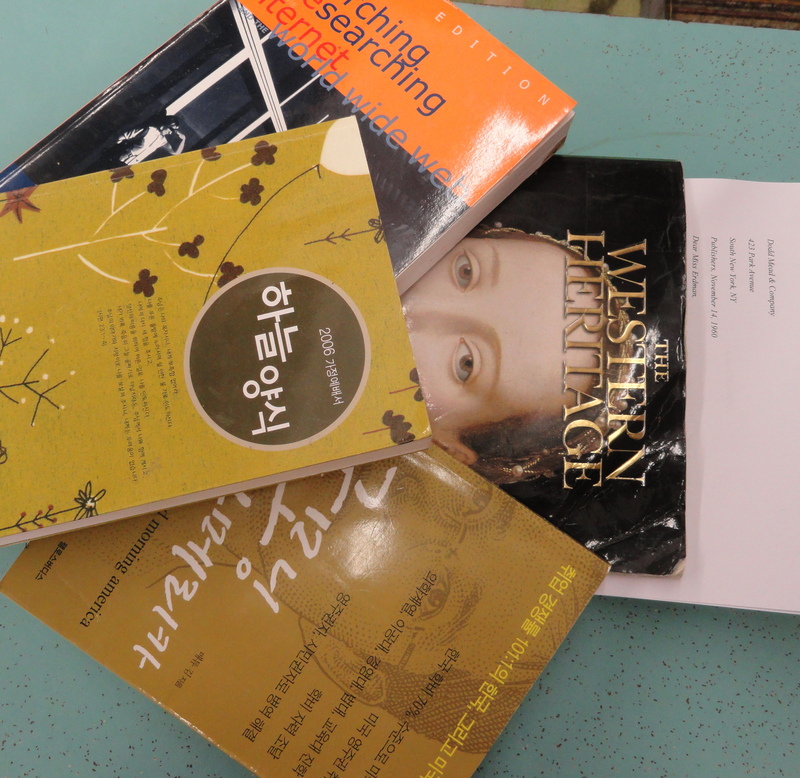 Another of the books was “Searching, Researching Internet and the World Wide Web”. More Greek. By far the most interesting of those left behind was the ones with a language I couldn’t decipher, unable to make heads nor tails of the titles. One of the books even appeared to be an inspirational day book with an inscription or dedication handwritten in Chinese characters. Thats when I discovered they were written in Korean. Or at least this is what the one page printed in English read. I would have loved to have known the story of who wrote the words. I wonder if it was given to a student by his or her parents as they prepared to leave their ancestral home to cross the world to study at a foreign university? Could it have been inscribed by a beloved teacher or grandparent and given as a gift to give them strength as they ventured out into the world? Who would ever know the memories treasured within? Surely not me. I can’t read Korean, and I don’t have friends that can translate either. This reminded me of a letter I found in Loula Grace Erdman’s scrapbooks housed at the Cornette Library on the campus at WTAMU. Erdman’s publisher R.T Bond with Dodd, Mead & Company Inc. sent a note dated November 14, 1960 concerning her book “Years of the Locust”, informing her that this was to be translated into Arabic, Persian, Urdu and Indonesian. The body of the letter explained, This will pay you only about Sixty dollars-but think of the fun you will have in reading your own writing in Urdu! And this is what links me to this blog. You never know where you will find that next bit of trivia that will brighten your story, or even lead it in another direction. A word, phrase or quote can change things in an instant, drag you back to reality, or give your character dimensions you never knew they possessed. Even though you think a book has no connection to the story you are writing you may find the catalyst to spur it forward. Any genre can benefit with a fresh look from another perspective to keep it bright and alive instead of stale and flat. Reading something outside your focus just might be the ticket to help you break free. Take for example my last blog about buses. Who knew that it would link to so many memories? And one of the responses from “Neeks” spurred me to share with my writing critique group her idea of using three words and making a story out of it. To get back on track. Beginning with the January meeting of the Panhandle Professional Writers I am going to set up a table of all sorts of discarded books from our bookstore in hopes that someone might find inspiration within the pages. All proceeds will go to benefit the Frontiers in Writing Conference. There will also be an extra jar for loose change collected for scholarships for Opportunity Plan Inc., This is one of our pet projects at our Buffalo Bookstore. On display will be all sorts of books. Some of them on public speaking can help spur you on with how to face an audience at a booksigning or as a guest speaker. We ALL need to be prepared. Government books can direct you to write about politics or political history. What a great time to live in a democracy! It doesn’t have to be just about Freedom or Civil Rights to make a good story. Look at “The Help”. What a tale Kathryn Stockett wove around a period in our history. And how about a book on marketing to expand your horizons on social media or community projects or marketing in general. Retail, salespeople, customer service can open your eyes to the workplace or writing for business, or even a “Chicken Soup For the Soul”. What about exercise? These books never go out of date and those used in physical education can be useful when you hit a wall in your writing. It only requires a few moments to get out of your chair and stretch that can brighten your focus to face your worst writers block. Come see what books you can find to inspire you in your writing. Celebrate the journey, not your destination. You never know where you will find something that will help in the translation. Please make plans to attend the Panhandle Professional Writers bi-monthly meeting on Saturday January 21, 2012. PPW is a wonderful, active, organization that is doing some great things for all levels of the writing community. The Frontiers in Writing Conference at Amarillo College in June will be an exciting time for any writer. Jodi Thomas’ Writing Academy in July rounds out the summer programs. Hospital scenes on television and in the movies are nothing like reality. I have yet to see one doctor pat a nurse’s backside. Nor have I noticed doctors and nurses sneak into a supply closet for a quickie. In fact the hospital routine is pretty boring. My niece recently had day surgery. Before the staff took her to the OR, the nurse anesthetist came in to meet with the patient. She verified my niece’s name matched the information on the bracelet. She confirmed the doctor and the procedure, and explained the process—sedative; anesthesia; intubation, and then she made way for the surgical nurse. Same procedure. The two ladies had different personalities. The anesthesiology nurse was pleasant but straight forward. The surgical nurse was professional but more personable. She assured us everything was under control. Then the doctor came in to mark the surgical field. Again, very nice, but totally professional. It’s no wonder writers exaggerate the setting. The trick is maintaining enough reality to keep the reader or television/movie viewer from sitting up and saying, “No way.” The long-running TV series ER is an excellent example of both good and bad writing. I truly loved this series, but I was also aware of the flaws. One can only go so far before the action is unbelievable. One episode that rang true centered on misdiagnosed toxemia. The mother presented with an infection, but as treatment progressed, it became apparent Mom and baby were in jeopardy. A botched C Section and inability to control bleeding lead to the mother’s death. Dr. Green’s attempts to come to terms with his mistakes were so believable the viewer could feel his pain and self-doubt. Not so believable was the disappearance of ER doctors from their shifts without having secured coverage for the department. Such action would result in the doctor’s dismissal from the hospital and possible suspension or loss of his license to practice. The quarantine episodes and the helicopter accident that deprived a surgeon of his arm were just too contrived to be good drama. One story line that was well written and beautifully performed was Dr. Green’s death from brain cancer. I lost my husband to brain cancer. Watching the deterioration of a vibrant character hit too close to home. I watched the episode once. I will never watch it again. It hurts too much. The ability to suspend disbelief, to make one believe the impossible is an art. It takes research, observation, and practice. But when done correctly and well, the reader or viewer is totally engrossed and satisfied with the work. The writer needs to develop good research techniques and professional sources so that his writing is believable. I challenge all of us to make the audience believe and accept exaggerations of reality. I dug a hole in the dirt and dropped my little seed in, covered it up and walked away from it. Then the bad weather hit and I completely forgot about what I had just planted. I didn’t water it or check on it at all. One day, after the storm ended, I walked down the pathway and suddenly remembered the seed. As I walked by the spot where I had buried it, I got a surprise. A stem poked up out of the ground with a couple of leaves. I knew from my biology classes in high school that under the dirt was an intricate network of roots. And these roots, while very necessary to the story, would never be seen by the above ground world. The roots are important to a plant because they give it nutrition. They absorb minerals and water from the ground. They also give the plant balance and structure. Another thing roots do is give the plant depth. However, the roots are not beautiful. They are never meant to be seen. The stem of the plant is fiber that conducts the nutrients to the rest of the plant. It also gives structure and height. The leaves are the main kitchens. This is where the outside elements come together to feed the body and roots. Photosynthesis takes place in the leaves and sends the nutrients to the rest of the plant. And then there’s the flower. The purpose of the flower is procreation. This is beauty and fragrance that lures in the pollinator. Once the bee finishes its job, a new seed for a new plant is created. Now. Did you see the story up there?